Drug peddlers provide recreational drugs including LSD to young girls at schools in exchange for their ‘suggestive’ photos. Ghastly as it is, that’s probably the tip of the iceberg. Females who take drugs are normally less. One of the main reasons the gender gets hooked is personality disorders. Normally, it begins around the age of 16 years to 24. Borderline Personality is a kind of disorder were the patient is emotionally unstable, impulsive and depressed all at once. There will be some individuals who have histrionic personality. These people want limelight, attention and we can see such examples in the media and film industry. So, they mostly seek drugs out of compulsion. These types of personalities are called cluster-B. Using drugs begins due to peer pressure. It’s the same for boys and girls. Statements like ‘have a sip of alcohol and be part of our group’, or ‘have a puff of this and you’re one of us’ is the usual sentiment and everyone wants to ‘belong’ to something at that budding age. 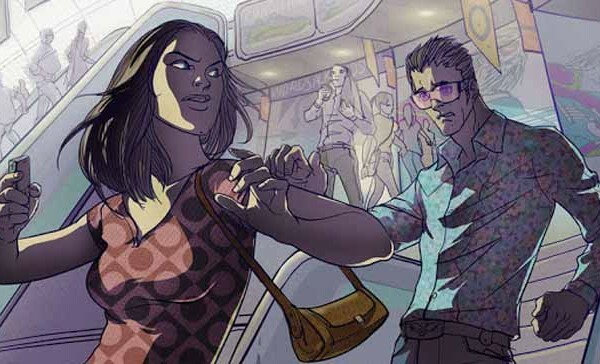 The friendships might break and groups disperse, and what remains is the ‘kick’ of the drugs. Information about narcotics and other recreational drugs is easily available with the click of a button. Even after moving away from their ‘bad friends’, one becomes habituated to using drugs and will do anything to get that high. What is needed is that our education system must have topics on psychological issues and drugs; such subjects are less and lack of information drives children towards wrong habits. Another bigger problem is stigma surrounding drugs. Sometimes, when parents talk about drugs, children may know more about it. I must warn that, if parents are thinking that it’s better to avoid such topics lest their ward gets curious about using it, then that is the most incorrect line of thought. Kids will find out from one or other sources. It’s better to educate them from home or in school and explain these are the drugs available and these will be the ill effects when used. One cannot forget that women are increasingly abusing drugs. In my opinion, it is because of “equal opportunities” for both genders. Most working women stay alone these days. There is cultural shift, job pressure and what have you. Most of the times women resort to drinking and drugs to ‘fit in’ with the men and be seen as their ‘equal’. Being single for a long time can be another frustrating reason for them to resort to abusing drugs; they are trying to release sexual tension in some way. Surprisingly, the rate of women taking drugs is increasing but, no one has statistics about their de-addiction and use. The main reason is that there are no center specifically for women that deals with the issue. 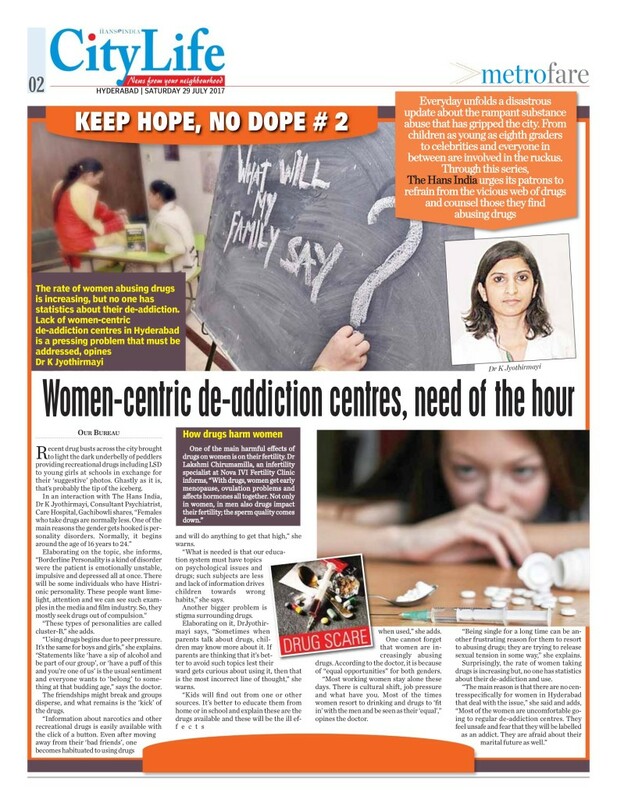 Most of the women are uncomfortable going to regular de-addiction centres. They feel unsafe and fear that they will be labelled as an addict. They are afraid about their marital future as well. Women-centric de-addiction centers is the need of the hour. Dr Jyothirmayi is a renowned Neuro Psychiatrist, Psychotherapist, Mental Health Counsellor and ex-Civil Assistant Surgeon based in Hyderabad. She is a medical doctor who facilitates speedy and effective recovery using a combination of psychotherapy (talk therapy) and psychopharmacology methods for people suffering with mind related issues like anxiety, work related stress, depression, addiction (various kinds), bipolar disorder, schizophrenia, marital issues, etc. Jyothirmayi holds both an MD in Psychiatry (State 1st - Gold Medalist) and MBBS from Osmania Medical College, Hyderabad.